Did the title scare you a little? Maybe make you wonder if the organic hype is all … hype? There is a lot of fear out there associated with the word “chemical”. The first reaction is to just say, no, we don’t. But there are approved products listed on the Permitted Substances List of the Canadian Organic Standard that we could use if we needed to. Many of them, we have simply never used. It can become a semantics game trying to define what one word means. These are emotionally loaded questions and answering them means first understanding just what the person is asking. If you take the definitions of chemical, pesticide or spray the multitude of possible uses of the term is a bit overwhelming! Chemicals in agriculture are used to fix problems. Pests eating the plants? Apply a chemical to the field to kill the pests. Coat the seeds in a chemical to prevent the plant from being vulnerable to insects from the time it is planted. What if we back it up a step? Where do pests come from? Are they lurking in vast numbers waiting to pounce the minute we plant a seed? Maybe. Most insects and microorganisms that eat plants are classified as pests. They tend to have a “boom-bust” life-cycle. They reach sexual maturity very quickly, have offspring in very high numbers and can fill any available niche in the ecosystem fairly rapidly if the conditions are right. Just like rabbits. The adult stage of a cabbage looper. The larval stage is a caterpillar which eats crucifer vegetables. When Europeans began farming this continent, they killed the wolves and coyotes. As the numbers of predators decreased, the numbers of prey increased. The population of rabbits was no longer controlled by predation. Their population exploded. Now wolves and coyotes are protected. A better balance is maintained when prey and predators are both present in the system. On our farm we try to avoid leaving a niche available for pests to fill. This is our first line of defense against a pest invasion. Before we even need to think about what pesticide options are available to us under the organic certification system, we put methods into place to avoid having to resort to them. 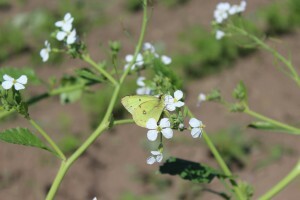 Method such as crop rotations and creating habitat for beneficial organisms are just some of the steps we take to avoid pests making our fields their homes. 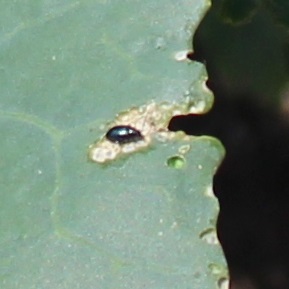 A flea beetle on green kale. If we do experience an infestation, such as flea beetles in some fields for instance, we rely on biologically derived pesticides, known as biopesticides, approved for use through the Canadian Organic Standard. In the case of flea beetles, we can use a product with the active ingredient Spinosad. This is a chemical compound produced by the bacteria Saccharopolyspora spinosa, which has a “broad insect pest spectrum, low mammalian toxicity, and a good environmental profile.” Importantly, the effects and by-products of breakdown of this biologically produced substance are not persistent in the environment. It breaks down quickly and harmlessly just as it does when secreted by the bacteria. 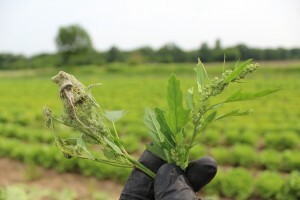 Another group of pests which come to mind are weeds, which are simply plants growing in the field that we don’t want growing there. Weeds growing in the field take nutrients and space away from the crops that are trying to grow. Lamb’s quarters is one of the weeds we contend with. This one is being attacked by it’s own pest. Anyone who has tended a backyard garden knows how pernicious weeds can be when they take over a garden. Imagine what a 100 acre field looks like when the weeds take hold! It’s easy to see why someone may resort to using a simple spray to control the blight that weeds can be on your crop. But because those chemicals can have a broad range of effects on the health of people and the environment they aren’t permitted in organic agriculture, and frankly, we don’t want to expose ourselves or our communities to them either. We manage most of our weeds the old fashioned way, through manual hoeing. This takes A LOT of labour and our hoeing team does back-breaking work for seemingly months on end in order to give our crops a head start, when they are just tiny seedlings, ahead of the weed growth. Another method we use for some seeded crops is called surface burning, where we use a propane flame to skim the top of the soil before the seedlings pop up out of the ground. This burns away the tiny weed plants already growing, again giving the seedlings a head start. A few weeks later our hoeing team has to come into the field to manually remove weeds which inevitably sprout up again. Some of our fields need a pass of the hoe 2 or 3 times in a season. You are more than welcome to come give us a hand if you are so inclined! Organic farmers are not allowed to use synthetic chemicals to control pests. There is also a strong emphasis in the organic standard to use other management practices first, before resorting to the biopesticides that are permitted. So while the Canadian Organic Standard does not permit the use of synthetic chemicals, having other options to manage ‘pests’ is an important part of the balance that can be struck. So as you can see the word chemical can be a very loaded term and often means different things to different people. Farmers take pride in the foods they are producing for the world and pest management can be a complicated part of bringing that food to the table.